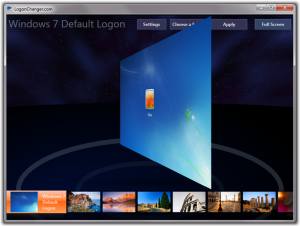 LogonChanger is a free Windows® 7 Logon Background Changer software that let you change the picture of the Windows® 7 logon screen also known as “welcome screen”, “login screen” or LogonUI. This Software is completely free, It does NOT change any system file, and the program itself does not requires admin rights to run: it will just ask you to run as admin a very simple cmd file that creates the required folder and registry key with the appropriate rights. Any user of the computer will then be able to change the logon screen picture. It creates a few JPEG files based on the image you want to put as wallpaper for the Windows® logon screen, applies the appropriate cropping and sizing and saves them using the best compression quality possible without problems of size. Works with Windows® 7 Home Basic, Home Premium, Professional, Ultimate, Enterprise and Starter, in x86 or x64 (32 or 64 bits). “Unable to write to folder c:\windows\system32\oobe\info\backgrounds\”. Solution : Open the “c:\windows\system32\oobe\info\” folder in Windows Explorer, then rename the “backgrounds” folder as “backgrounds2”.